Zebra Cobra, distribution Caprivi Zipfel and surrounds. 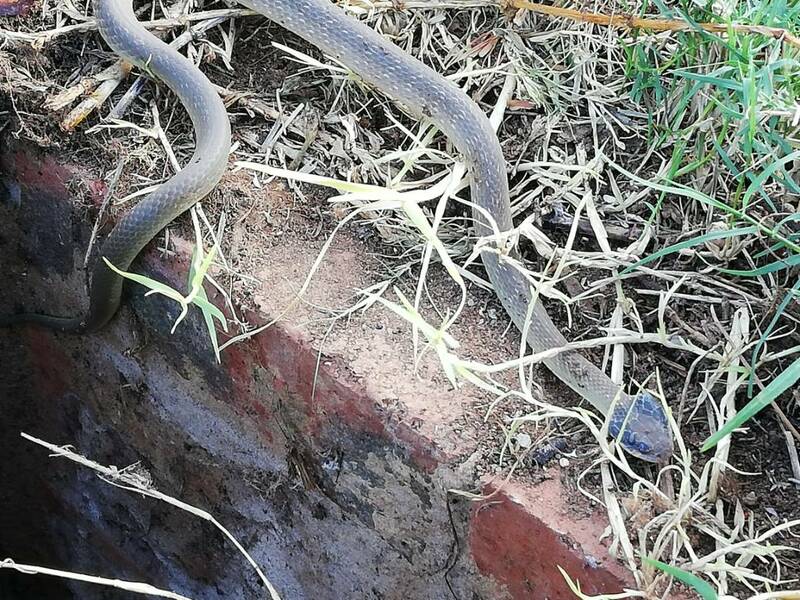 I would appreciate it if the area of where the photo was taken is also mentioned by the person posting a pic of a snake. 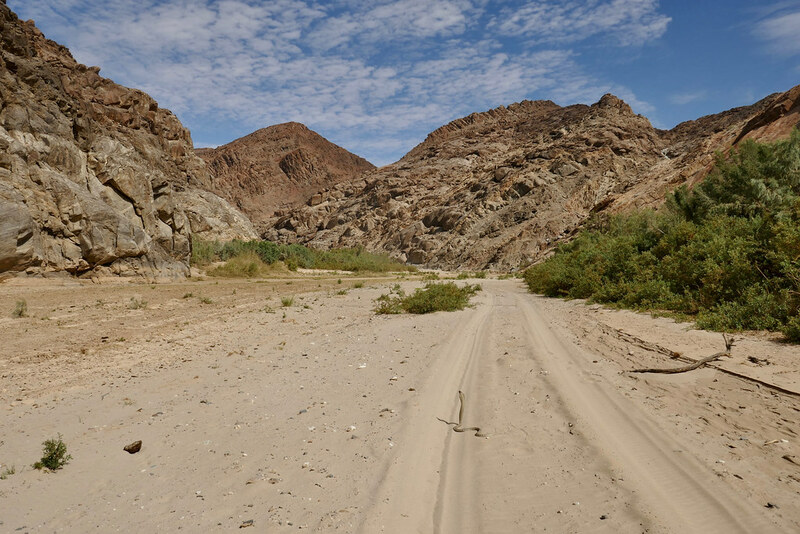 Area is Kaokoland in Namibia, must be either the Ugab or Hoanib river by the looks of the area. Close - Hoarusib river, Puros canyon. yes, it looks like that area, I see this one has a lighter coloration, possibly because the dryer area, the ones in the Caprivi is much darker and lighter contrast. In 2015 i was relocated to Tsumeb. Found a flat and the elderly chat told me. Seun hou maar jou deure toe. Ander gaan jy n surprice kry as jy terugkom. Mambas and Angolan spitting cobra or like the locals call them (Zebra snake) was obviously their concern. Now he wasnt scared of the mambas but he told me that up there the Zebra snake was the most dangerous. Due to not having their anti venom available or something like that. Any truth to this? If you are asking me - sorry, I know nothing about snakes. But even with that caveat the anecdotal evidence seems to indicate that what the old gentleman told you may be true. I had exactly the same warning issued to me by good people of Puros at the Puros Community Bushlodge - always keep the doors closed, because of what they called spitting cobra (which I think is pretty safe bet that the snake in the image is - I actually remember feeling quite safe when taking those pictures sitting on the bike just because I had googles on ). Actually I remember on my first visit there many years ago, the sand around the roundavel was meticulously swept and there was very clear zig-zag pattern following the circumference of the building. It was so regular and pretty, that I complimented the lodge guy there for a nice touch. To which he replied that it is indeed from spitting cobra. I then cemented my survivalist credentials by asking if it is poisonous - it apparently is. 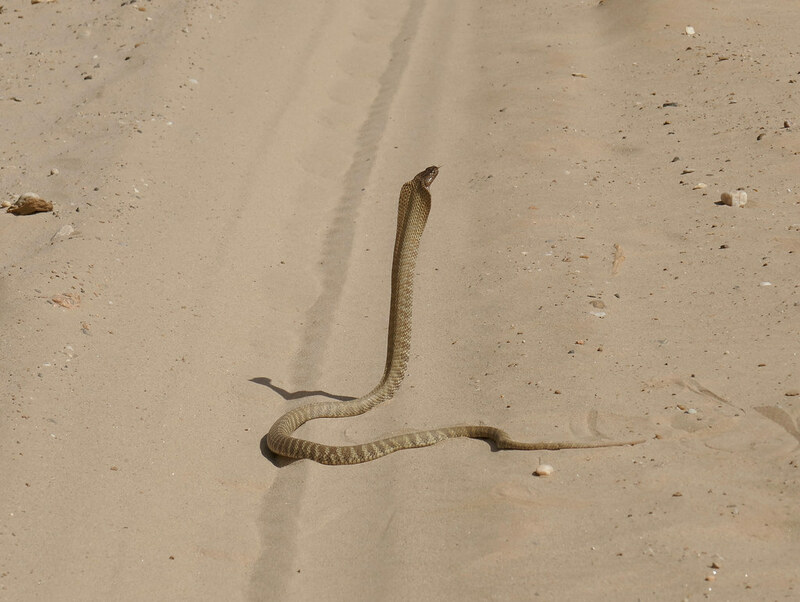 As far as if it is more dangerous than mamba - again, no idea, but I do find these kind of comparisons kind of ridiculous, at least out in the bush (in Tsumeb with hospital closeby the difference indeed may be critical). I'm pretty sure that one proper bite from any of those two out there in Puros canyon would basically be game over. Sure, we had some painkillers and bandages but I somehow think that those wouldn't be good enough even for mamba bite. As far as aggression goes - again no idea. 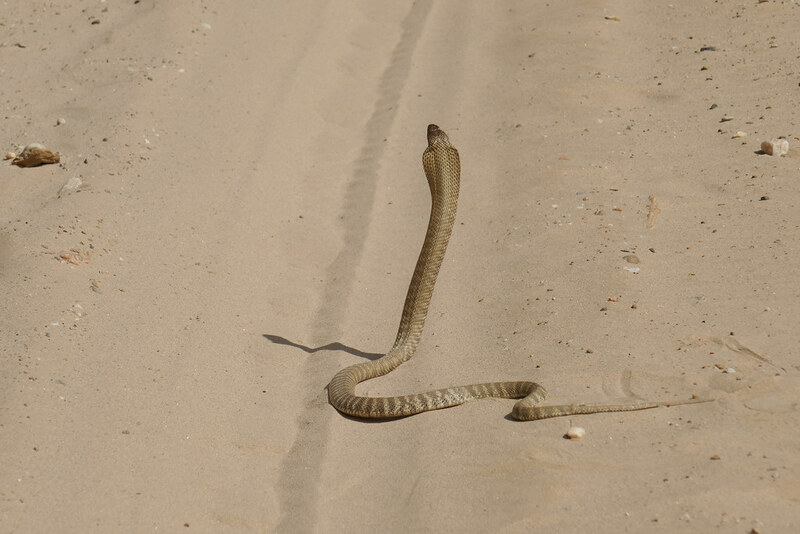 I have no idea how this snake appeared on the track where just a minute ago JustBendIt was parked waiting for me. One guess would be the Justin run it over and dug it out of the sand with his 500 - you can see the snake sitting on top of Justin's track - but as I said no idea. The snake stood in that warning position for the whole time I was there taking pictures about 3-4 meters from it, but when I gave it wide berth it sliden away seamlessly. It didn't try to attack me while taking pictures which took for good 2 - 3 minutes. I have huge respect for snakes and they fascinate me hugely. As i remember the uncle said that the mamba where more venimous but with the Zebra snake getting antivenom was the problem. I the 3 months i was there, he killed 2 Mambas in his yard on the same day!!! The locals had a few people(Children as well) bitten by a zebra snake. Do not know what happened. Seeing the pyffy earlier reminded me of the run in i had with a puffy in my garage. Changing the cars timing belt wife came in to ask if i wanted some coffee and started shouting at me snake snake. Obviously i jumped. We caught the puffy and let it go in the park but upon investigating where the puffy was in relation to my feet i got a huge SKRIK! anycase we have had a few juvinile molesnakes in the house, a few cobras passing by but this was the first puffadder in about 7 years. 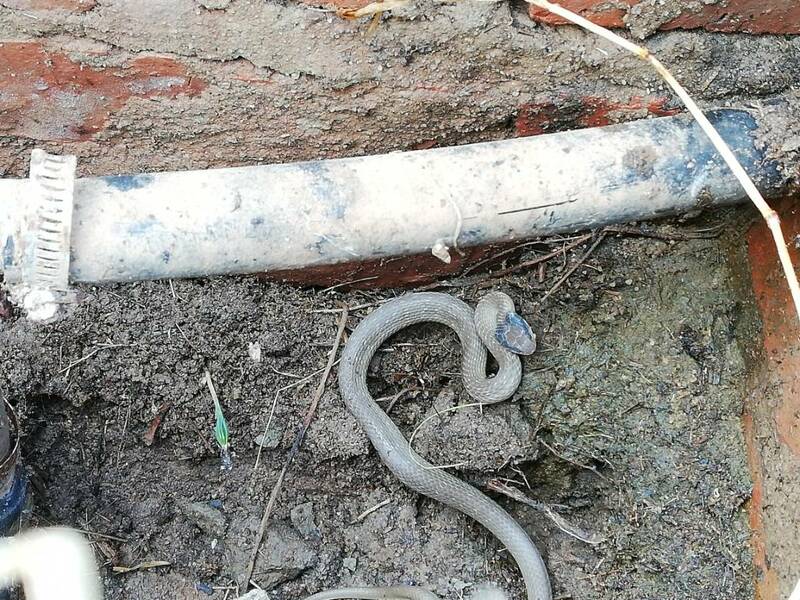 In very hot areas the snakes will enter homes/huts because it is cooler, also, because it is so hot in those areas we leave the windows and doors open. Snakes will only bite/spit when they feel threatend. Sometimes when stepped on or rolled over onto in bed. Definitely a red lipped herald. Herald snake, also called the red lip snake, but some do not have the red lips. (on the lower part of the mouth) Mildly venomous. It can change the shape of it's head to imetate an adder. 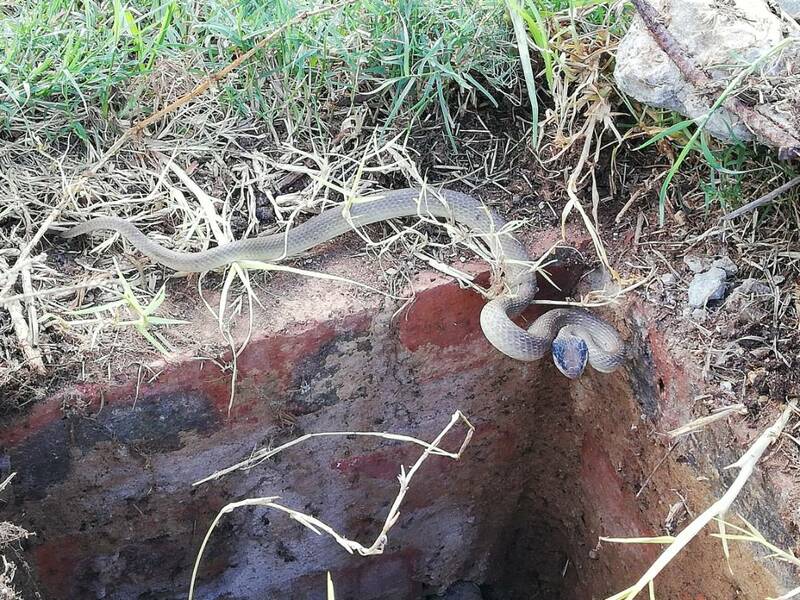 Interesting snippet of useless info...... the existence of this snake was first reported in the Eastern Cape Herald newspaper, from there the name.